Dry shampoo is suppose to be a substitute for the regular shampoo. But does it really work. Now everyone is different. What may work for me or you, may not work for someone else. So in this post I will talk about two dry shampoo products. My mom had brought these two to try on her hair, so I wanted to try it on my hair too. Both were at separate times, because one didn't really work. The other one didn't really do anything either. The first dry shampoo is Suave professionals Keratin infusion. It works on all hair types. Which is a great thing. This product says that this dry shampoo is formulated with Keralock Technology contains keratin and absorbs oils to help clean hair. Leaving your hair feeling smooth,refreshed, and manageable between your regular hair washes. As I am reading this my mom and I are saying it would be good to try. You can use this on dry hair or just washed hair for extra volume. I have use this on my own hair a couple of times and I have used this on my mom 's hair. Honestly for me I did not really see a change, I know your suppose to use it more than a couple of times but I didn't really find it useful. When I used it on my mom I actually saw some what of a difference, but not enough to say I really like this. I was a little disappointed, but everyone is different like I have said before. 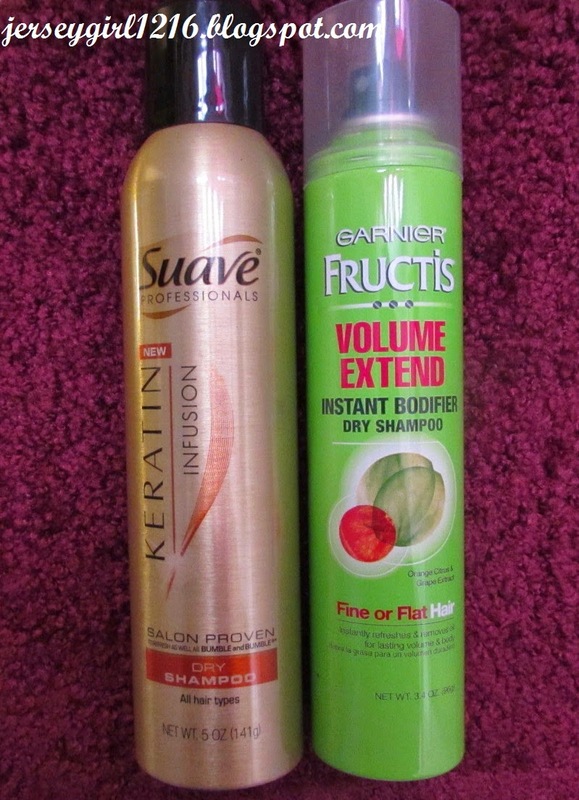 The second dry shampoo is Garnier Fructis Volume Extend Instant Bodifier. This product is only for fine or flat hair, so this was not the product for me because I am the opposite. But this might help someone decided whether they should get it or not. It says that this dry shampoo, instantly refreshes and removes oil for lasting volume and body. This product containing a blend of orange citrus and grape extract, immediately refreshes and bodifies lifeless locks. Creating volume you can see and feel. Honestly I am sure this product would work for someone else. I love garnier fructis products. I have used their shampoos and conditioners. I even used their blow drying cream, but this product just didn't work for me. These products say will give your hair body, that's nice but I could just use hairspray. This is only my opinion and does not take away their other great products, this just did not work. But it may work for you.